If you’re an IT professional looking to deploy Windows 10, I highly encourage you to look into this series of online training videos called “Windows 10 Update for IT PROs”. It consists of 5 modules and each module is about 30-45min long so you could actually get through it all in an afternoon. Module 1 – Windows as a Service: What does it mean for your business? 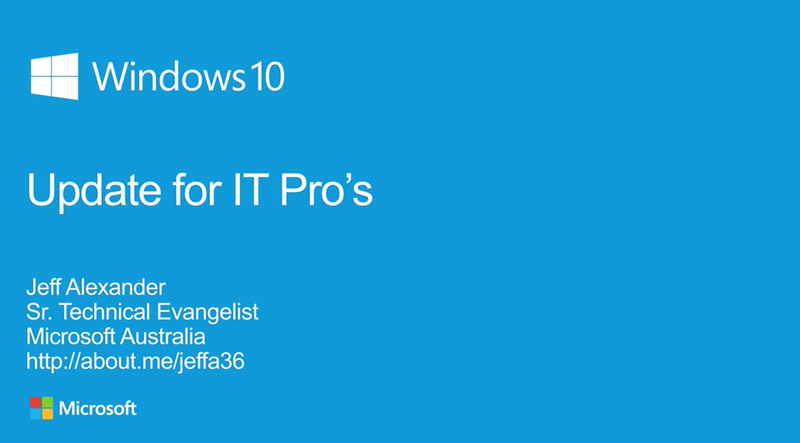 In this module we’ll discuss how servicing and updating of Windows is changing with the release of Windows 10. We’ll also cover how we move to a more rapid response cadence when it comes to updates. In this module we’ll cover what’s new in Windows 10 deployment and the new and updated ways to update devices. We’ll cover in-place upgrades, new provisioning tools to convert BYOD devices into Enterprise devices. Windows has always had a strong management platform and that continues to get better in Windows 10. In this module we’ll cover what’s new with management and how the new features will help you better manage devices in the enterprise.